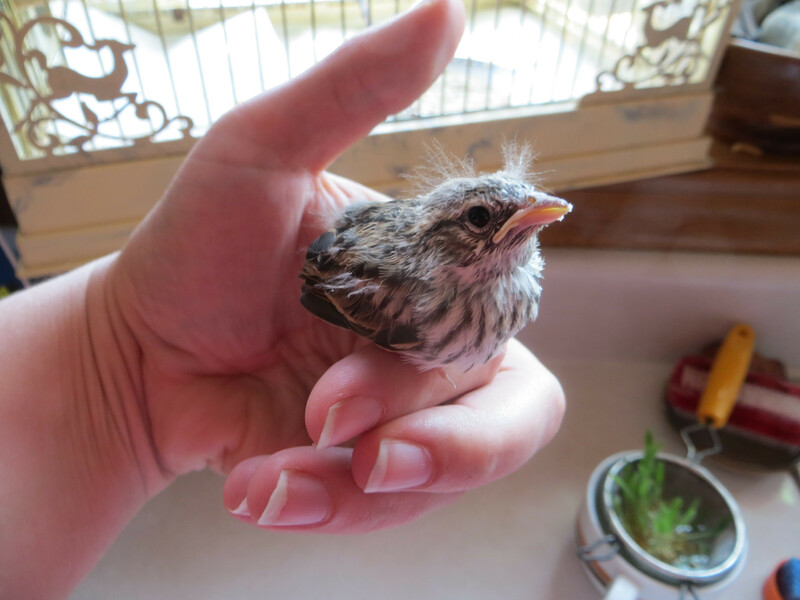 Share the post "Day 1: ‘What Is That Thing?’ Day 36: ‘WOW, That’s Beautiful, What An Amazing Transformation!’"
It’s a baby songbird. My brother had been out jogging, and found it on the sidewalk. It was actually still attached to part of its shell and some dried membranes. 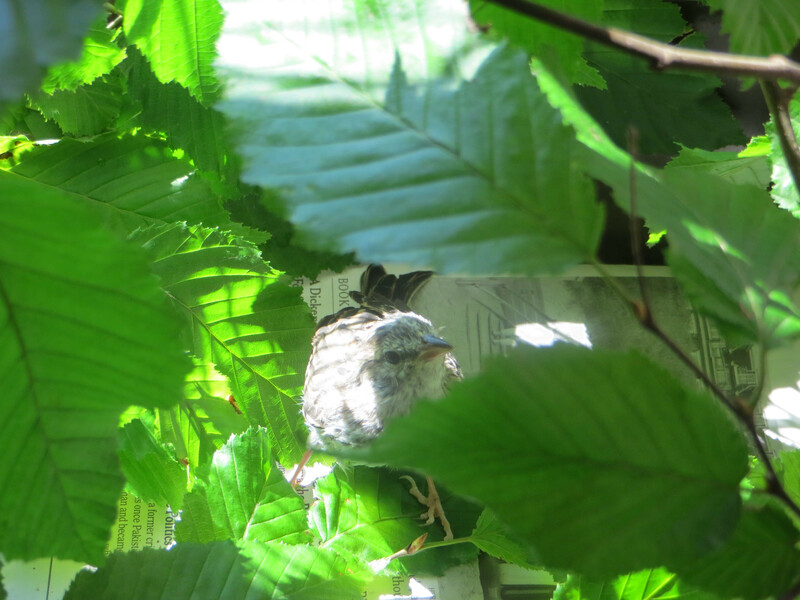 Clearly freshly hatched, we were unable to locate the nest in the group of trees above us. 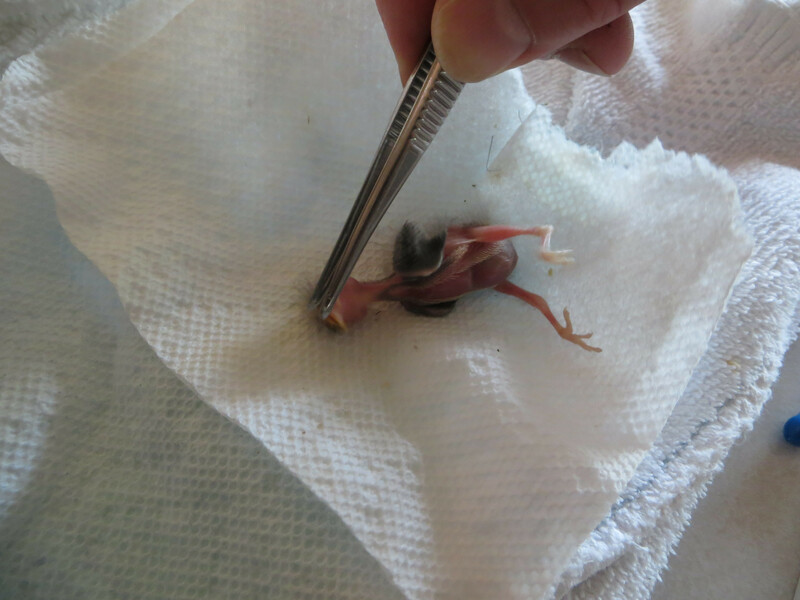 **NOTE** if you find a bird this young, it is best to try to locate the nest and put it back in. 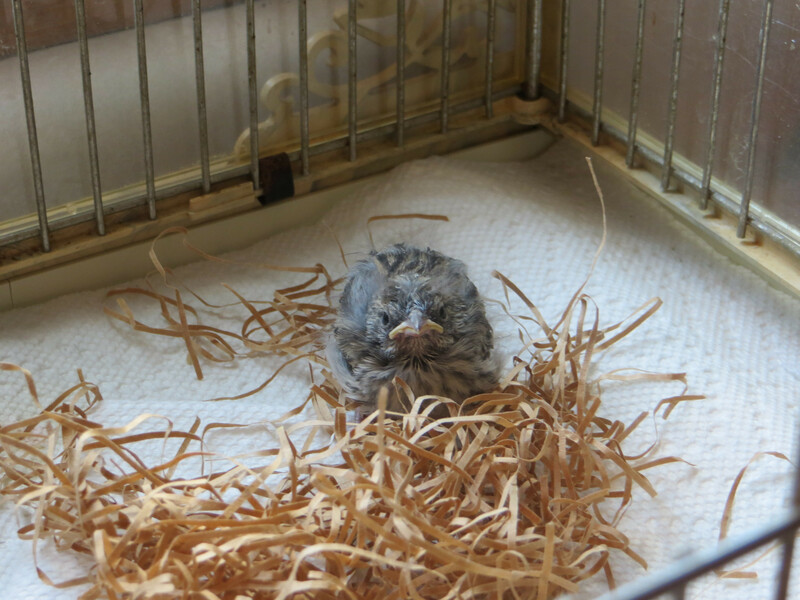 There is a myth that you can’t touch a baby bird, because the parents will reject it due to the smell of humans. 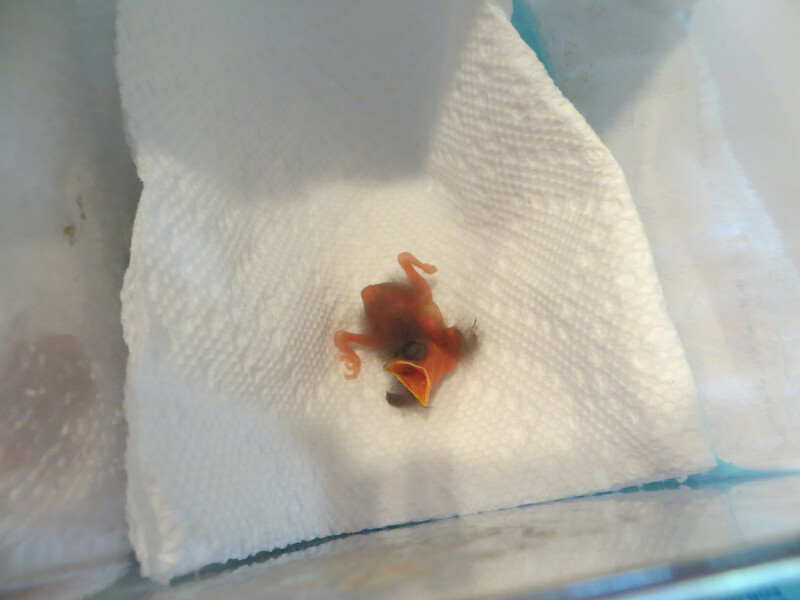 Since we were unable to locate the nest and have experience with this kind of thing, we (myself and my mother, who I enlisted to help with this endevour) decided to try and raise the little thing. 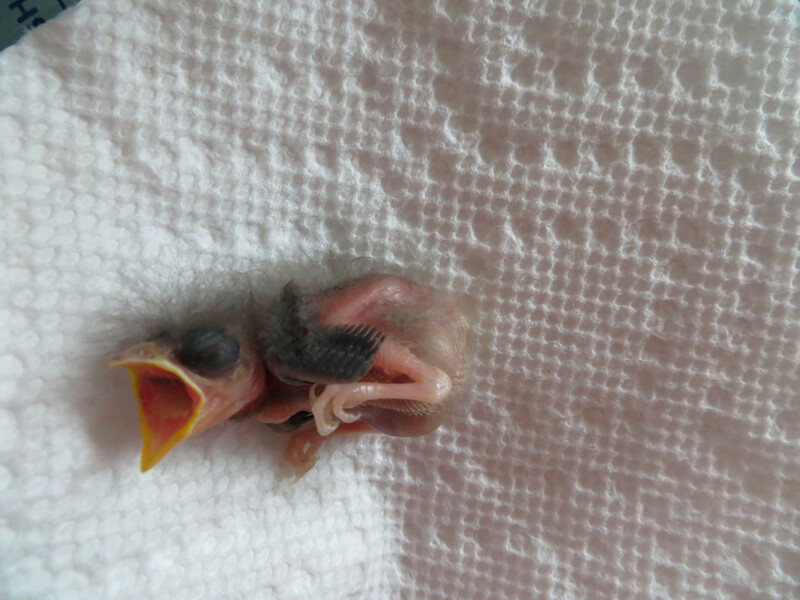 Aren’t baby birds cute in an ugly kind of way? We kept the chick in a homemade incubator, carefully controlling the humidity and temperature. 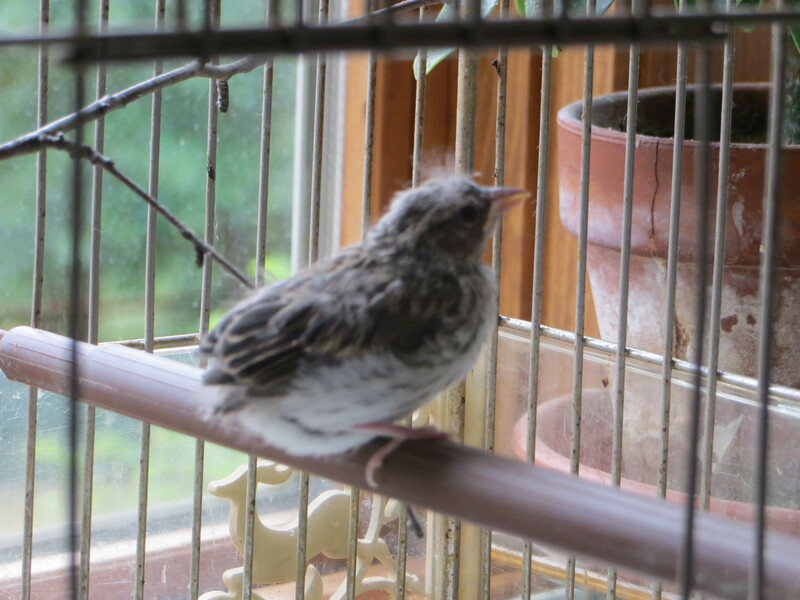 We decided she was a she (though we were never able to find out if it was male or female), and called her “Dumpling.” All baby birds look very similar, so we had no way to really know what kind of bird this was. We’d have to wait and see how she grew, and what her feathers looked like. 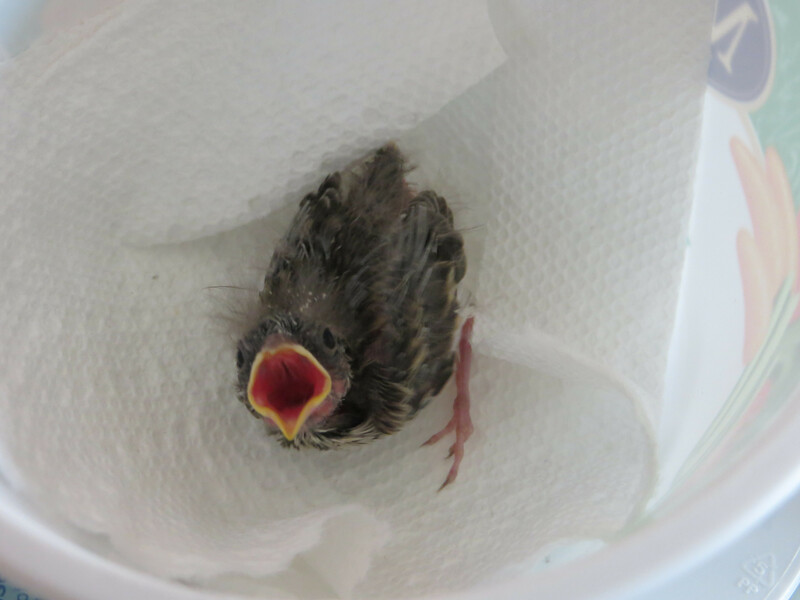 Baby birds eat a lot! We fed this chick primarily with crickets, mealworms, waxworms, caught insects, and a commercially available liquid formula for chicks. We fed the chick every 30 minutes for 14 hours/day, simulating what she would get in the wild. Just imagine what that means! 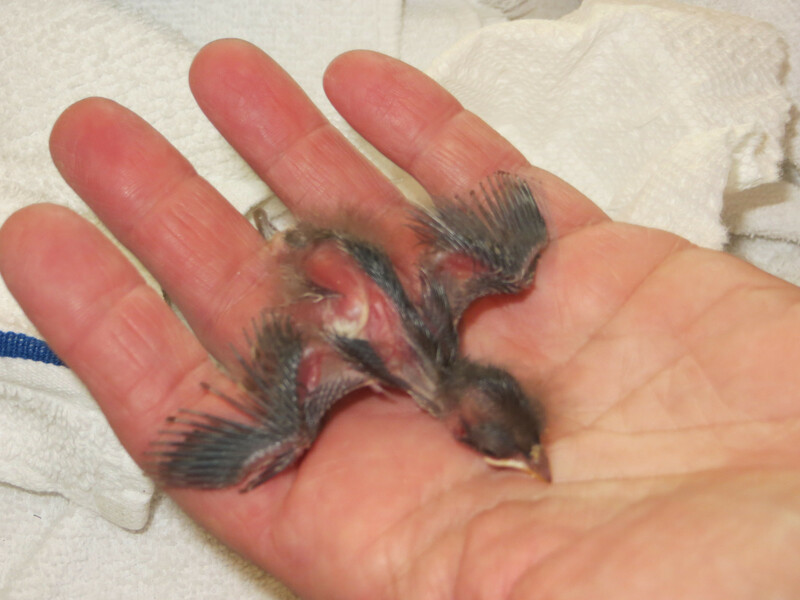 This was just one chick, and most songbird broods will have anywhere from 2 – 5 chicks. 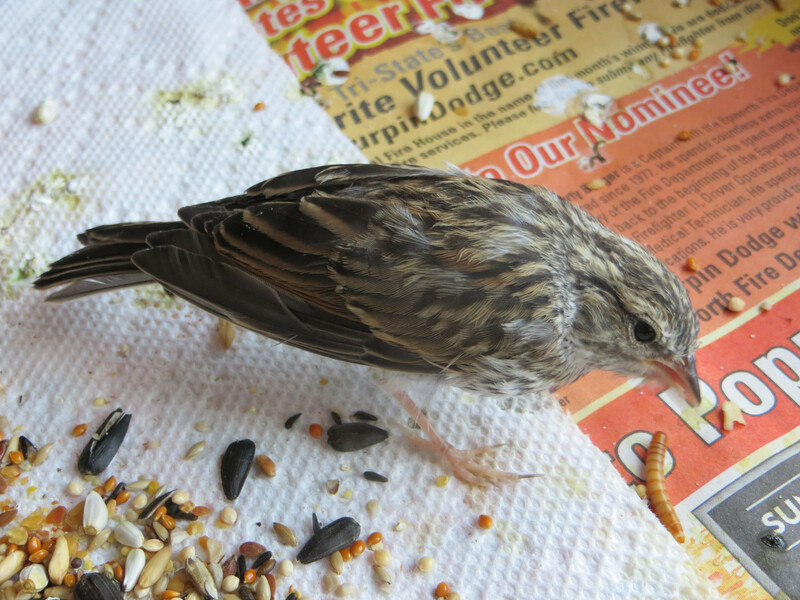 The amount of insects songbird parents need to catch to feed their chicks (and themselves) is a bit staggering when you think about it. Since the parents don’t feed their chicks overnight, we didn’t either. This is opposed to many mammalian babies that need to be fed regularly around the clock. You can see here the amazing development of the wing feathers in just a few days’ time. 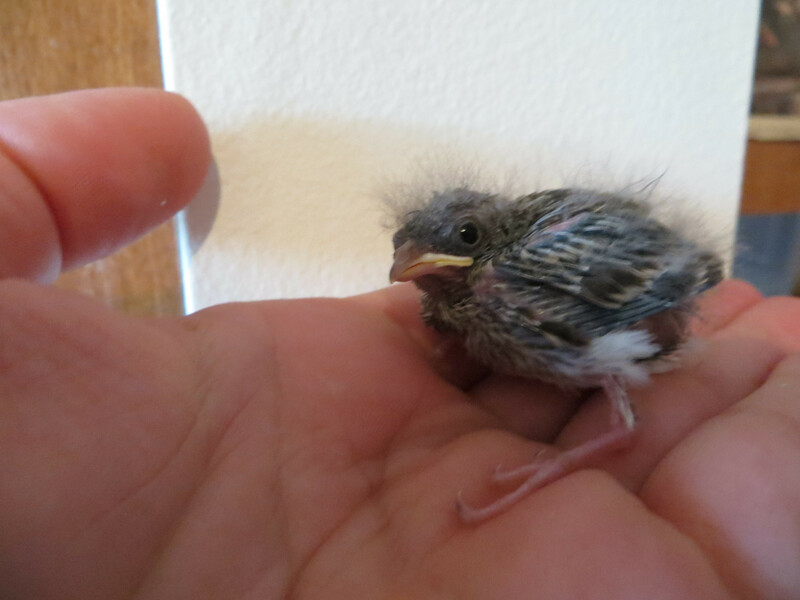 Also, she had a hilarious wispy mohawk of down feathers that got even more ridiculous when she got a little older. She would start squawking to be fed every 30-45 minutes. An interesting note: instincts are fascinating with these animals. Even with the poor coordination and closed eyes, this chick knew enough to back up to the edge of the nest we made for her and poop over the side, so as to not dirty the nest. By day 5, Dumpling was able to sit more “sternal” (on her chest with the legs tucked under her body) with more stability. Look at the changes in the feathers in just another 24 hours! She is actually starting to look like a bird! Her eyes were starting to open just a little bit by this time, as well. Here is a nice shot of the amazing continued development of her wing feathers. You can see them encased in a cornified sheath. Once the feather gets to its final size, this sheath disintegrates and the feather is allowed to spread open. Overnight, all of the feather sheaths fell away and -tada!- we have a bird! You can see here as well that she has a bent lateral toe on her left leg. Not much to be done about that in a bird this small, and it really didn’t slow her down at all. “FEED ME! !” At this point, she was eating 3 large crickets +/- waxworms at every feeding. 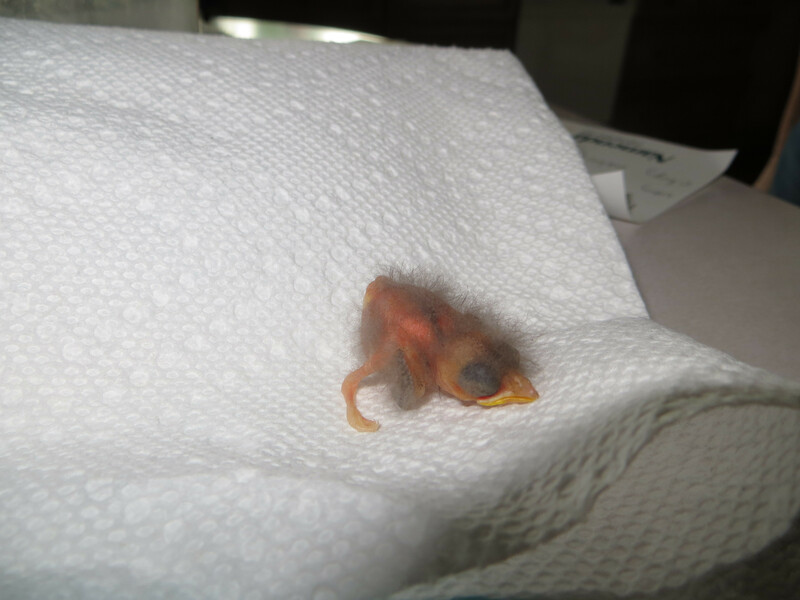 By this time, we were able to stop using the incubator. Since her body was covered in feathers, she was able to regulate her body heat on her own. The tufts of chick fluff and the eternally grumpy expression that baby birds have was hilarious. We moved her into more of a conventional cage, and gave her more materials to explore. She was really happy, despite her expression. She was able to officially perch for the first time! Definitely a big step in the right direction. She doesn’t have much of a tail yet, so her balance isn’t great, but she had a really strong grip and could hold herself up there very well, bad toe and all. 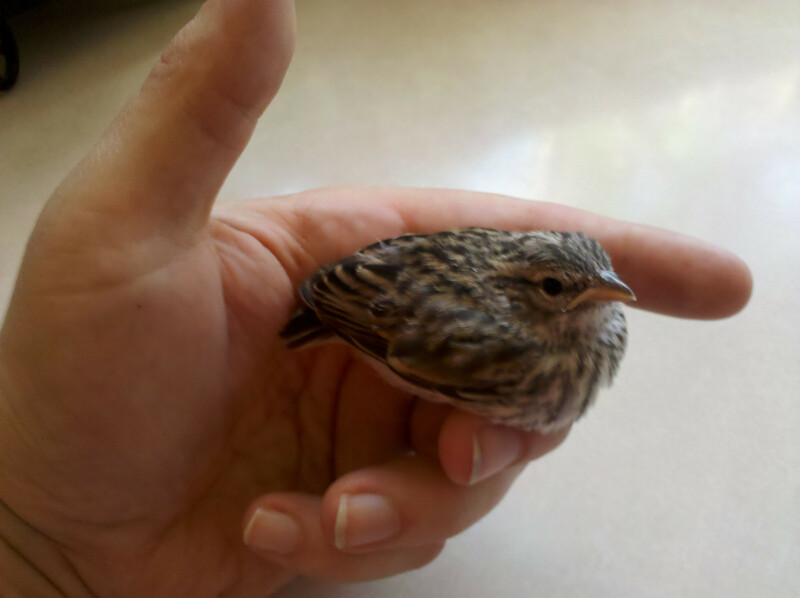 She was a very sweet little bird, and enjoyed perching on our hands, early on. 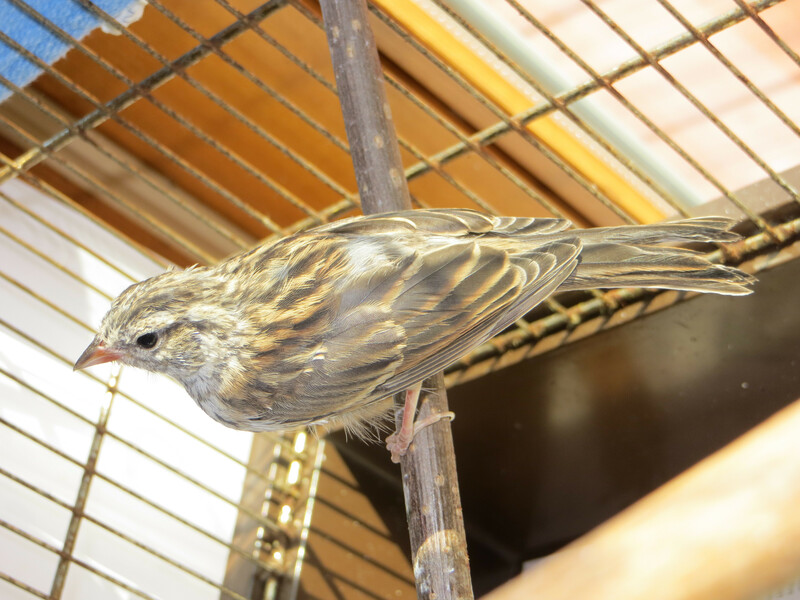 You can see some sprouting millet seeds in the background, which we added to her diet to continue to increase the variety of food she was exposed to. By this point, we actually didn’t have to feed her as often. 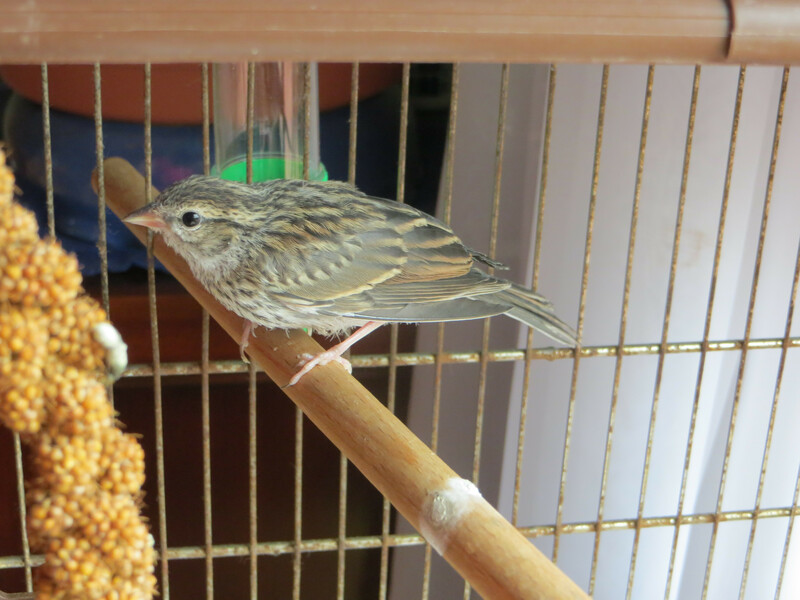 We would hand feed her every 1-2 hours, and place worms in the cage for her to forage for in between times. Almost 2 weeks from hatching, and she is now perching very well! You can see that her strength and balance has improved even compared to Day 11. 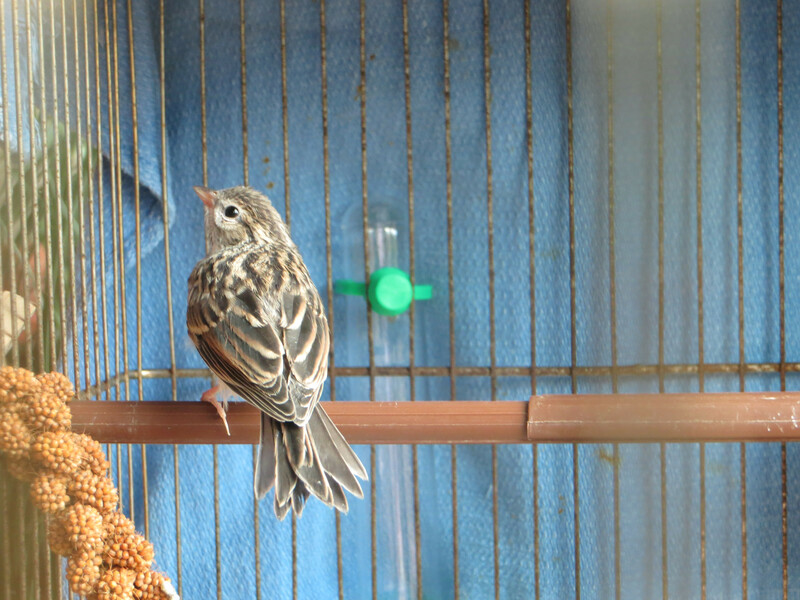 Her legs are more upright, showing a better perching posture. 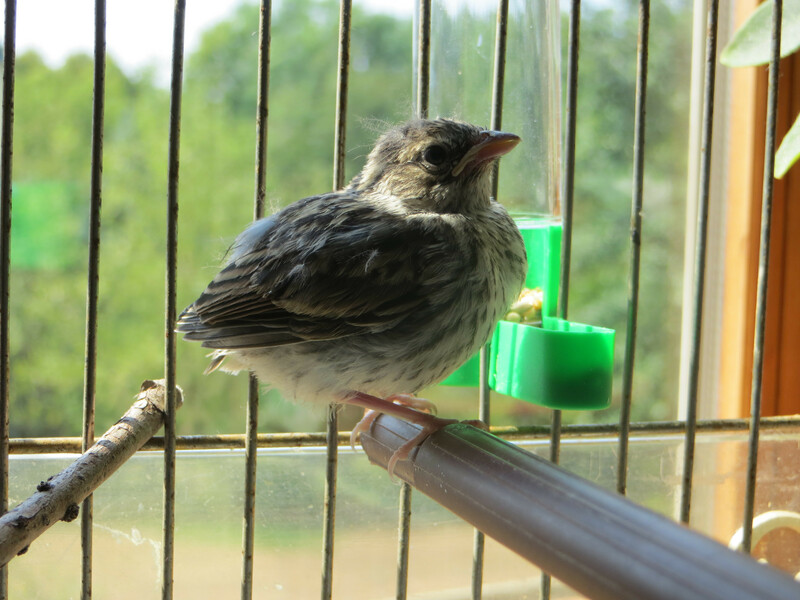 This “hocks up” posture is very characteristic of 14-day old songbird chicks, so she is right on schedule. She is starting to look more mature. That hilarious baby down is disappearing. Now that she is over 2 weeks old, I’ll start skipping days. Here she is in a larger cage that she graduated to. 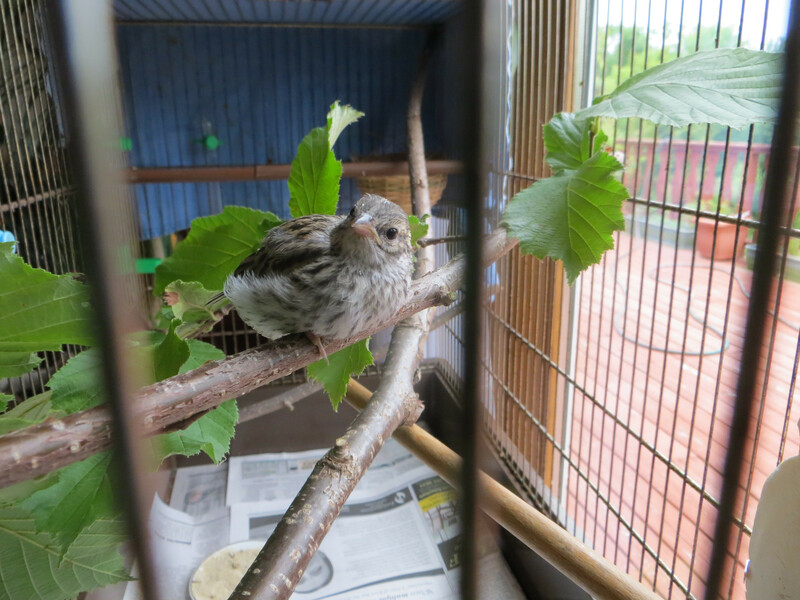 We put in freshly cut branches so she can have a variety of perching options, and can explore the leaves and twigs like she would in the wild. By this point, she is hopping and flying around the cage like a professional. **NOTE** Any of you with pet birds, it is very important to have a variety of perches. The best ones are branches you cut yourself from non-toxic trees. It’s great, healthy enrichment for your pets! 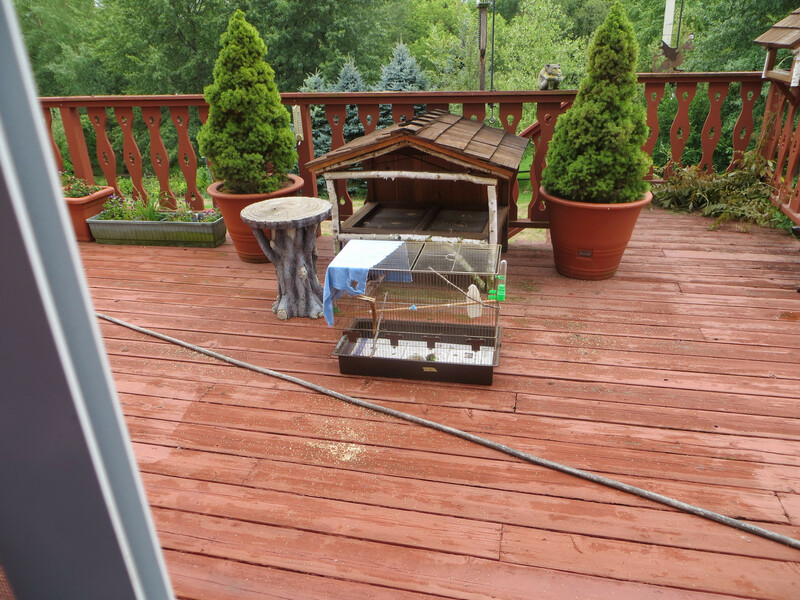 We started placing her cage out on the deck to get her exposed to the wind, the sun and other birds. This is one of my favorite pictures of her, showing her wonderfully patterned feathers. 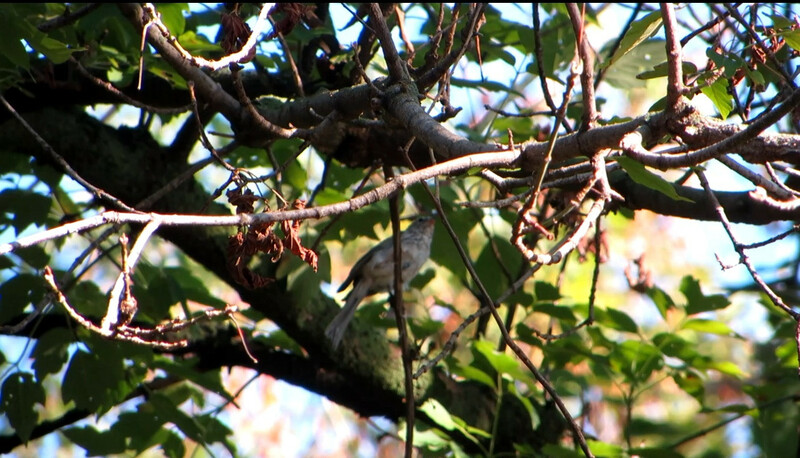 By this point, we decided she was likely a White Crowned Sparrow. It is a species of bird that is common around here, but you don’t see them often because they don’t come to bird feeders regularly. 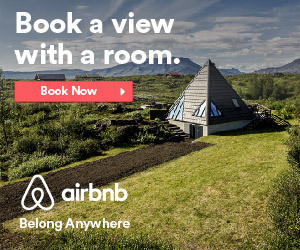 They are a migratory species, traveling south for the winter. We were hoping to get her fit for release in plenty of time to make that trip. Another lovely side view of her, showing her feather patterning. It provides for great camouflage as they flit among the trees. By this time, she was completely off of eating crickets (showed absolutely no interest in them), and her diet was more seed and worm-based. She was also eating on her own, completely. She actually didn’t let us feed her anymore, which was a good sign. She loved all of the new leafy branches we’d put in for her. A large part of their diet in the wild is tree buds, and she’d go after those immediately whenever we put fresh branches in for her. At this point, she was essentially releasable. However, there were some expected storms rolling in over the next few days, so we decided to keep her for a few days longer to give her the best chance. After storms the night before, Day 36 dawned beautifully. Confident that the weather was going to be nice for several days, and that the recent rainfall would give her plenty of drinking and feeding opportunities, we decided this would be the perfect day to send her on her way! We drove to a nearby nature preserve about a mile from where she was initially found and where we knew there to be others of her kind. We opened the cage door and stepped back. After a few minutes, she hopped out and flitted immediately up into a tree. She didn’t hesitate at all. She immediately started exploring the branches, biting at tree buds and hopping from branch-to-branch like a wild bird. Pretty soon, we lost sight of her. 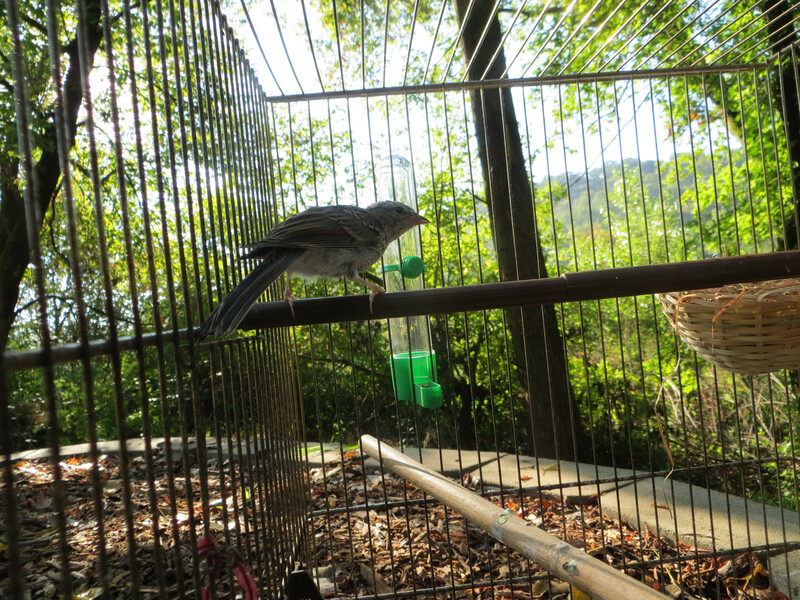 Hopefully, you enjoyed Dumpling’s story, and learned a little about wild birds. 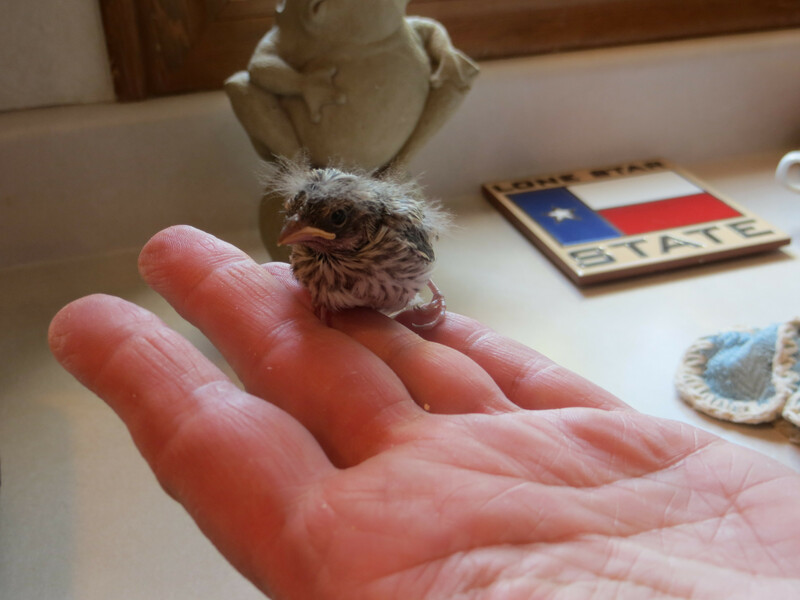 I can’t stress enough that you shouldn’t try to raise wildlife of any sort unless you’re trained to. 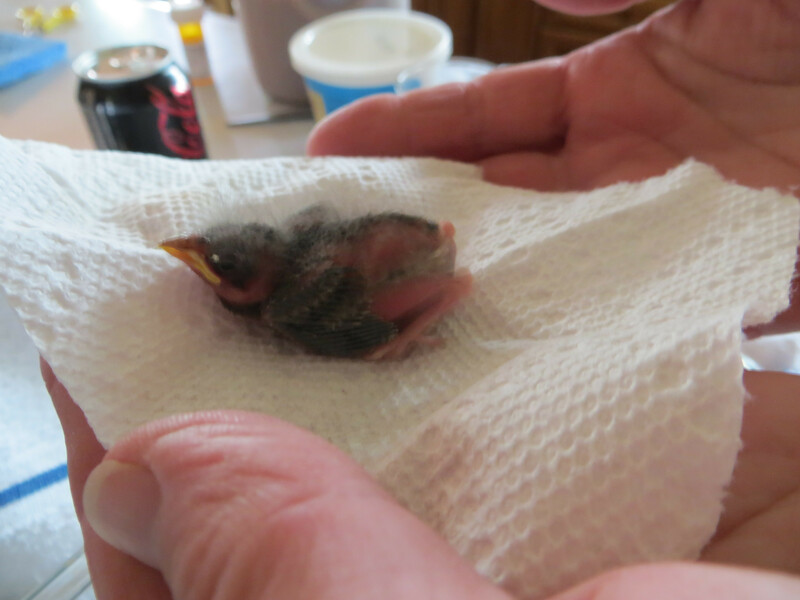 Find a local wildlife rehabber or veterinarian to help you out! I encourage you all though to enjoy nature’s little miracles that are all around you! « 18 Things That Happen When You And Your Sibling Have A Huge Age Gap	» This Couple Spotted An Old Can While Walking Their Dog. You Will NEVER Guess What Was In It.